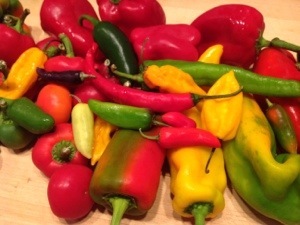 I have been experimenting with all of the lovely peppers I found at market the past few weeks. 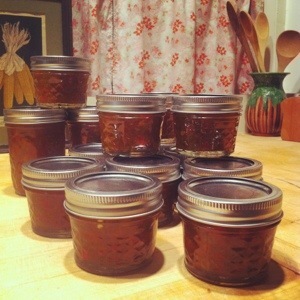 I tried making pepper jelly for the first time and canning it to keep for the wintery months. The first batch came out awesome! It was delicious – not too sweet, not too hot, just the right amount of kick. 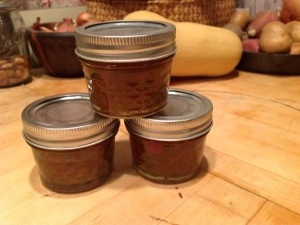 My second batch was a bit hotter because I switched up the peppers a bit and added in a chocolate Habanero. 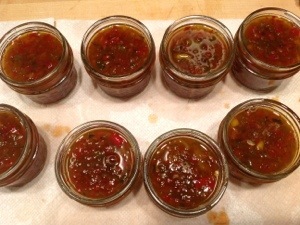 I have been reading a lot of pepper jelly recipes from around the web to get ideas. I took a little advice from each of them. I used a bunch of different peppers from around market. The stand holders have an explosion of them this time of year, as the plants produce their final peppers of the season. Since they are so abundant, you can get a lot of peppers for a little bit of money. I used a spectrum of peppers, in colors and in heat. My first two batches included peppers ranging from Habanero hot to bell pepper mild. Here are some of the peppers that I used: green bell, red bell, cherry pepper, jalapeno, chocolate habanero, anaheim chile, hungarian wax, poblano, serrano, bolivian rainbow (I think), and others that had no label at the market. Here are a few pepper identification sites from around the web if you don’t know your peppers. some of them also tell you the heat levels – very helpful. Check them out: Epicurious, Chow, and Saveur. I don’t think the exact peppers you use will matter that much, it’s more about the ratio of hot to mild. I am not very heat tolerant so I used a lot of sweet peppers and kind of mild hot peppers like jalapenos and cherry peppers in the first round. 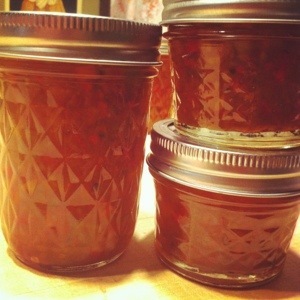 I’m writing a recipe that gives the overall quantity of peppers to use in the jelly mixture. The ratio you use is up to you. I think the best ratio of 4 1/2 -5 cups mild/sweet peppers to 1/2 cup hot peppers. It really depends on the type of hot peppers you use… warning: if you use 1/2 cup of Habanero then your jelly is going to be hot! Cut up all of your peppers really small, or put them in the food processor and pulse them until they are cut into small pieces – but don’t turn them into paste. 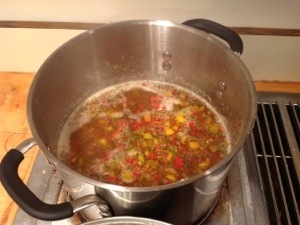 Bring the peppers and vinegar up to a boil and gradually add in the pectin, stirring constantly. Allow the mixture to boil hard for a few minutes. Add in the sugar and honey and bring the mixture back up to a rolling boil. Allow to boil again for about 5 minutes, stirring the mixture. Prepare your jars and lids. Here’s a really good resource on how to prep your jars so they are clean and sterile. Fill your heated jars with the jelly, leaving about 1/4 inch head-space in each jar, make sure the edges are clean, cover with lids and screw the bands on. Boil the jars for ten minutes and remove from canner. Allow the jars to cool, they will seal and the jelly will set within 24 hours. The seals are usually good soon after you remove them from the canner and they start to cool. 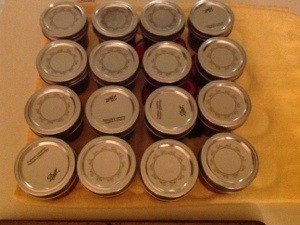 Check the lids and if they did not seal within 24 hours then process the jars again. This jelly is not as thick as regular fruit jelly. If your jelly is sliding around in the jar, it is ok! It is a good consistency for placing atop a piece of cheese. 1. Be very careful when handling the peppers! Wear gloves – seriously, really – wear gloves. If you cut up and clean the seeds out of a bunch of hot peppers… your hands are going to burn. It might not happen right away, but a little while later, or right about when you have to start canning the jelly, your hands are going to be on fire. I have had this happen to me both times I made this jelly. You think I would have learned after the first time, right? Well I did learn but silly me just tried to put plastic baggies on my hands for protection because I didn’t have gloves. That was a mistake because my hands still hurt and burned. 2. I made up another theory about what might be happening to cause the burning on my skin. I have no scientific evidence to back this up so it might sound dumb. I was not wearing gloves while cooking the jelly and all of the steam was hitting my hands as I stirred. I realized that some of the capsaicin had to be going into the air because it was making me cough. So I am not sure, but I thought maybe that was what was making my hands burn. I will be doing more research on this. I will also be buying a box of gloves and wearing them every time I cut up a bunch of hot peppers. 3. The jelly is a thinner consistency than fruit jelly normally is. I like this consistency. It is good for spreading on a cracker with cheese. If you like your jelly a little thicker, add about 1/2 tbsp more of pectin to your batch. I also read that some people drain their peppers before they cook them with the vinegar. I didn’t want to do that because I felt like I was loosing a bunch of the flavor. 4. I list 5-5 1/2 cups of peppers because it is hard sometimes to get an exact amount with out wasting some of the peppers. I also don’t think that it’s necessary to be that exact when measuring out the peppers. I had a few little differences in the batches I made and they both came out great. You should measure out the other ingredients pretty accurately because the other ingredients will have more of an affect how your jelly turns out. 5. I used the small 4 oz. ball jars. This batch filled about 16 of them. I think they are a great way to serve the jelly. You can set the jar out next to a piece of cheese and it looks cute with a little serving spoon in it. You don’t have to search for a small serving bowl and you can just put the lid back on if there is any left… but there probably won’t be any left. I paired this savory jelly with wheat crackers and a specialty aged cheddar cheese from Cabot Creamery. This is my new favorite snack… and quiet possibly my favorite cheese combination ever! You will be hooked after you try it. If you are interested in cheese making – I know I am – then watch this video on one of Cabot’s specialty cheeses. I would love to visit the place where they age all the cheeses or visit the creamery itself. Thanks to my chef friend Aaron for some inspiration with the pepper jelly and paring, I had his version a few weeks back and it was amazing! Mmmmm! I want some – the hottest you’ve got! ← One Super September Saturday!